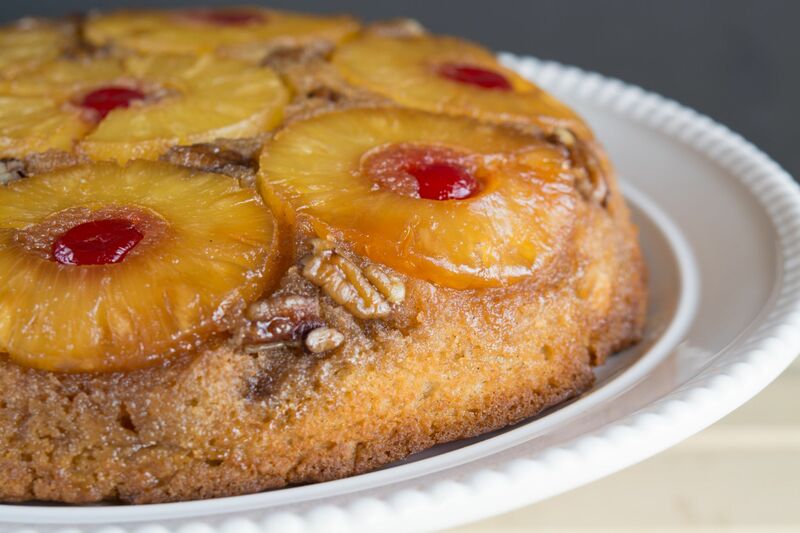 Pineapple upside-down cake is one of those desserts that is so popular in Latin America that many Latinos believe it was first made in whatever country they’re from. But that could not be further from the truth. 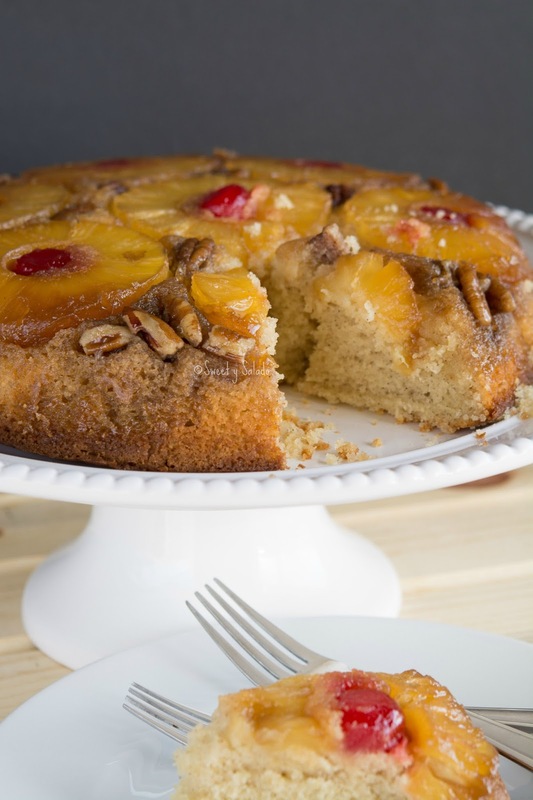 Upside-down cakes have been made in the US since at least the 1800’s but this particular cake became increasingly popular in the 1920’s when canned goods were all the rage. The traditional way to make it is by using a cast iron skillet because it helps the sugar caramelize nicely without burning the butter. But that’s not to say that you cannot make it in a regular cake pan or deep pie dish, which is what I use to make it. I personally think that the cake itself can come out a bit bland and that may be the reason why so many people tend to only eat the sweet, buttery crust, but not the actual cake. An easy way to solve that is to add not only vanilla extract but also ground cinnamon. 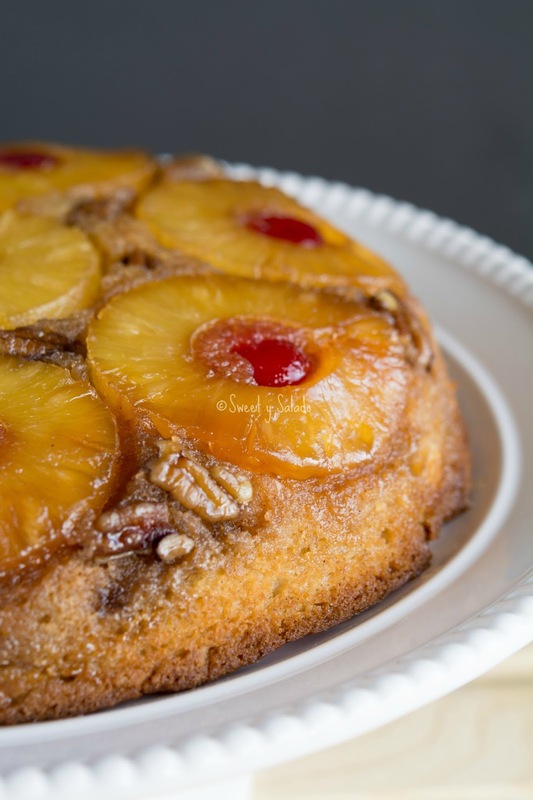 Trust me on this, it gives the cake great flavor, especially when combined with the caramelized sugar and pineapple rings. As for the gaps in between the pineapple rings, I like to fill them in with pecan pieces to give it a delicious crunch, some people like to fill them with small pieces of pineapple or you can just leave them as is. Place the butter for the topping in a 10 inch (25 cm) cake pan or a 10 inch deep pie dish and melt it in the oven. Take the pan out of the oven and mix in the brown sugar making sure you're covering the pan well. 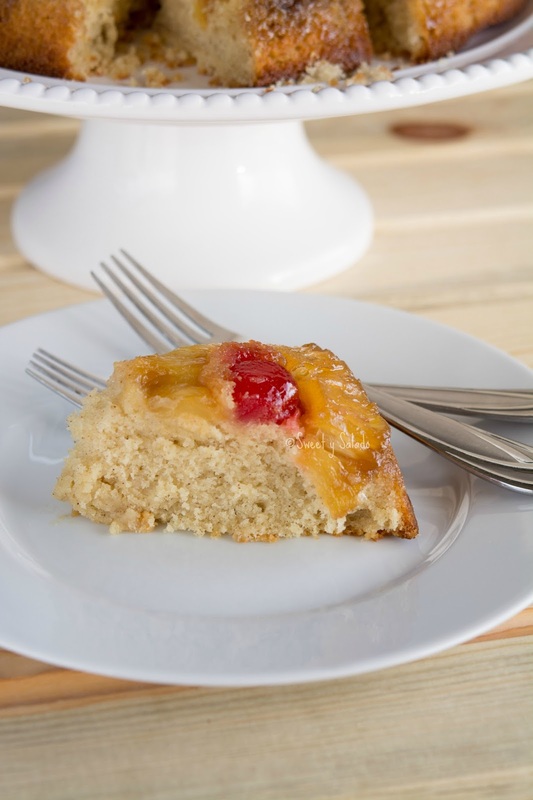 Arrange the pineapple slices on top of the brown sugar and then place one cherry in the center of each slice. If you want, you can fill in the gaps with the pecan pieces or with smaller pieces of pineapple. Set aside. In a medium bowl sift together the flour, baking powder, cinnamon and salt. Set aside. In a large bowl cream together the room temperature butter with the white sugar. Now add one of the eggs and beat to incorporate. Add the second egg with the vanilla extract, beat again. Now add 1/3 of the flour mixture and mix enough only to incorporate it. Add the milk, mix again. Add a second 1/3 of flour and mix. Then add the pineapple juice, mix one more time. Finally, add the last 1/3 of the flour and mix. Make sure to scrape the bowl with a spatula to make sure everything was mixed well. Pour the batter on top pineapple slices and bake for 35-45 minutes or until a knife inserted in the middle comes out clean. Remember that baking times vary depending on the type of baking pan or dish you're using. Let the cake rest inside the pan on top of a cooling rack and then invert it over a serving platter. It's best when served warm and you can also serve it with with whipped cream or vanilla ice cream.